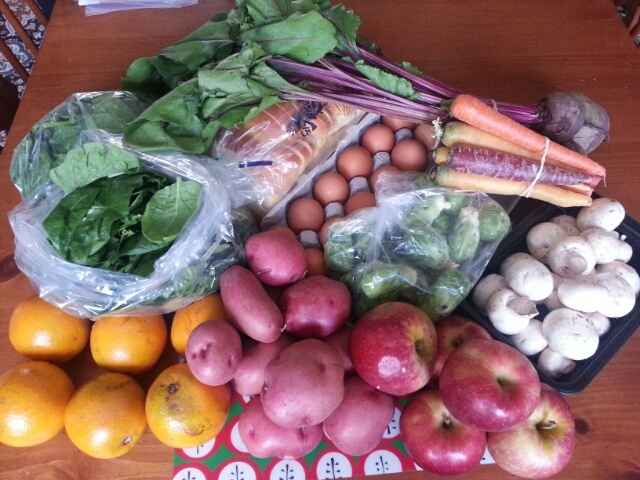 This week in the CSA: spinach, oranges, red potatoes, apples, mushrooms, brussels sprouts, rainbow carrots, beets, eggs, and bread (Great Harvest challah, again). The plan, already half-implemented: oranges and apples eaten as is; spinach and mushrooms sauteed and incorporated with eggs into frittata; brussels sprouts roasted with garlic; beet greens wilted and baked into something involving pasta and cheese; beets boiled and pureed into soup; potatoes diced into hash; carrots sliced into split pea soup, to be served with grilled cheese sandwiches featuring the challah. We don’t eat fancy in our house, but we do eat well. The NYT has an article out titled Simple Rules for Healthy Eating, which basically calls for eating more foods prepared from scratch, being conscious of your caloric intake, and eating with other people whenever you can. As a full-time working mom in a dual-income household, my free time is precious, and I do sink a lot of said precious “free” time into the rituals of food preparation: washing, storing, chopping, cooking, and the endless dishes that follow. And after all that, it’s often disheartening to watch the Little Prince refuse vegetables that I’ve painstakingly prepared for him (though I’ve recently had a lot of success burying greens in pasta and cheese). That said, though, I find it personally rewarding to be able to take a mixed bag of vegetables every week, and using nothing more than a knife and some pots and pans, turn it into meals. It’s like magic. And it’s very satisfying.